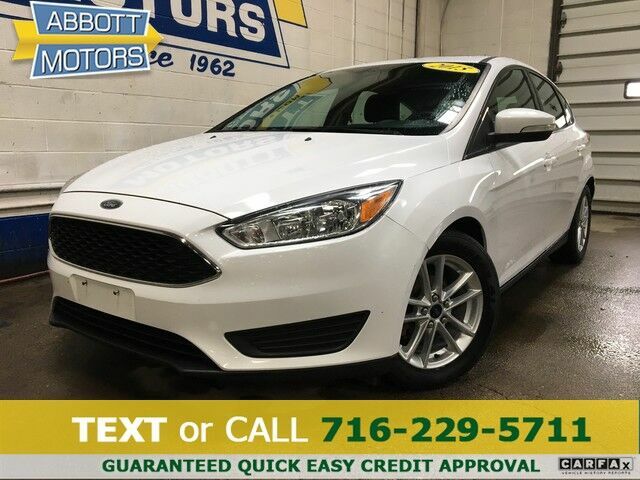 ABBOTT MOTORS, An exceptional car buying Experience, is offering this exceptional Oxford White 2015 Ford Focus SE Sedan w/Moonroof for sale. ABBOTT MOTORS has over 50 years of automotive experience! We are also a CARFAX Advantage Dealer. We offer great deals and specialize in FINANCING FOR EVERYONE-ALL CREDIT APPS ACCEPTED! We look forward to helping you purchase your next vehicle. CALL or TEXT (716) 229-5711 for quick answers to your questions about this vehicle. Your message will be answered by a real human never an automated system This Ford includes: POWER MOONROOF Generic Sun/Moonroof Sun/Moonroof WHEELS: 17" MACHINED-ALUMINUM Aluminum Wheels SE SPORT PACKAGE Fog Lamps Transmission w/Dual Shift Mode Tires - Front Performance Aluminum Wheels 4-Wheel Disc Brakes Rear Spoiler Leather Steering Wheel Tires - Rear Performance ABS This 2015 Ford Focus comes with a CARFAX Buyback Guarantee, which means you can buy with certainty. Start enjoying more time in your new ride and less time at the gas station with this 2015 Ford Focus. This Ford Focus is beautiful and the interior is clean with virtually no flaws. Most vehicles are forgettable, but then there is the 2015 Ford Focus SE This high-performance vehicle provides a memorable experience each time you drive it. The engineers at Ford, without question, designed a masterful automobile that provides all of the "essential perks" needed for someone like you. Equipped with many extra features, this well-appointed vehicle is a treat to drive. This car comes equipped with recently replaced all-season tires. The paint on this car has a showroom glossy finish. This Ford is equipped with some of the most amazing wheels the market has to offer! Once you take this Ford Focus SE for a test drive, you'll instantly realize how much of an added bonus this vehicle's upgraded wheels provide. More information about the 2015 Ford Focus: The Ford Focus is a small car that offers a number of features otherwise seen in larger or more luxurious vehicles. For instance, the Focus is the first vehicle in its class to offer Active Park Assist, which can actually guide and steer the car into a parking space if the driver moderates speed with the brake. It's also the first small car to offer Ford's MyFord Touch system, which relies on a sophisticated touch-screen system and has advanced voice-command features and can even provide Wi-Fi for the car and the area surrounding. Technology aside, the new Focus stands out from the class for its excellent handling and poise, sporty driving feel and impressive fuel economy. Strengths of this model include fuel-efficient powertrains, sleek, charismatic style, handling and poise, fully electric Focus available, sport-oriented ST model, Innovative technology such as Active Park Assist and MyFord Touch, and choice of hatchback or sedan STOP IN TODAY or Apply Online 24/7 at Abbottmotors.com ... All Trade-ins Welcome... Same Day Delivery... Call or Text Today and See The Difference... We Look Forward to Serving You! !This vehicle may be subject to potential open recall(s). Vehicle recall information may be found at Safecar.gov. Please verify price, equipment, options and features with your sales rep before your purchase. We Look Forward to Serving You. *Tax, title, plates extra. All Financing On Approved Credit. BBB accredited A+ member.